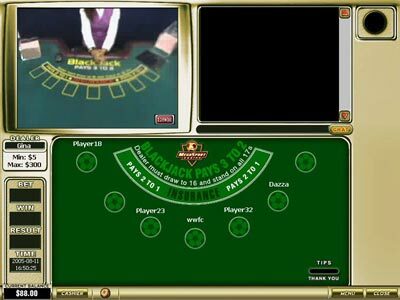 The object of the game of Blackjack is to get a hand which totals as close to 21 as possible. The card's suit has no importance in Blackjack. The game starts of by the player placing his bet on the table. The dealer then deals each player a card (either face-up or face-down depending on game style and casino) as well as himself a card face-down. Then all players are dealt another card and the final card to be dealt is the dealer's second card, but this time face-up. Each player looks at is cards, adding the face value of the two cards dealt to him/her. If the player feels that the sum of the face values isn't close enough to 21, the player can request another card from the dealer (this is referred to as a "hit"). This process repeats until the player "stands". This process is done for all players at the table. If the player feels that, with the two initial cards dealt, the total is close enough to 21, then the player can just stand and not have to receive another card. The dealer then turns over the face-down card in front of him/her and goes through the process of hitting and then finally standing. The total at which the dealer has to deal himself another card, is determined by the casino's rules for the game. Typically the minimum value that a dealer will stand is 17, anything lower the dealer has to take another card. Any player and the dealer who's total exceeds 21 is said to have "bust" and is finished playing for the round. The player (this includes the dealer) who is the closest to 21 is the winner. If two or more players (again including the dealer) has the same highest total, it is a push and player(s) gets their bet back. Face cards (King, Queen and Jack) have a value of 10, an Ace has a value of either 1 or 11 and all the other cards' value is the number printed on them. Thus, as an example, if the player is dealt an Ace and a 5, the total will be either 6 or 16, depending on the player. If the player asks to be "hit", the dealer will deal him another card. If the third card, as an example, is an 8, the player's total will either be 24 (which is bust) or 14 (still in the game). The player can then ask to be hit again, but must keep in mind that if he is dealt a value higher than 7, he will bust. The player can then choose to stand or take the chance. A special hand that can be dealt in Blackjack is called "Blackjack". This is when the player or dealer's initial cards is an Ace with a face card or a 10. This is basically an instant win to whoever receives it and usually pays out at a higher rate than a normal win, usually at 3 to 2 (e.g. if you bet 2, you will receive 3 back plus your original bet). If the dealer gets Blackjack, the game ends and the round is over unless another player also has blackjack in which case it is a push. Insurance - If the dealers face up card is an Ace. This bet wins if the dealer gets blackjack. Surrender - Give up your hand and only lose half of your bet. Split Hand - If two cards of the same value are dealt to the player, the player can "split" his hand but has to bet the same amount that he initially bet. Always remember to check the casino's rules for Blackjack as to what bets that are available and what the payouts are.